Pita pocket dinners are so quick to make – you could have this on the table in about 20 minutes. The only step which takes time is marinating the lamb. I put the marinade together before work and left the lamb in it all day, ready to cook when we got home. Pitas to serve – dependent on how hungry you are! 1. Mix together the lamb marinade and place the sliced lamb in it to marinade for several hours. 2. Heat a frying pan on medium-high heat. 3. While it is heating mix together the spinach, tomatoes, olives, and cucumber. Mix the vinegar and oil together and toss through the salad. Top with crumbled feta. 4. Fry the lamb quickly, don’t overcook. This will only take a couple of minutes on each side. 5. The easiest way to heat pita breads is in the toaster. They will puff up and go slightly crispy. Once you have heated them chop a small piece of the top off – just enough to fit the fillings in. 6. 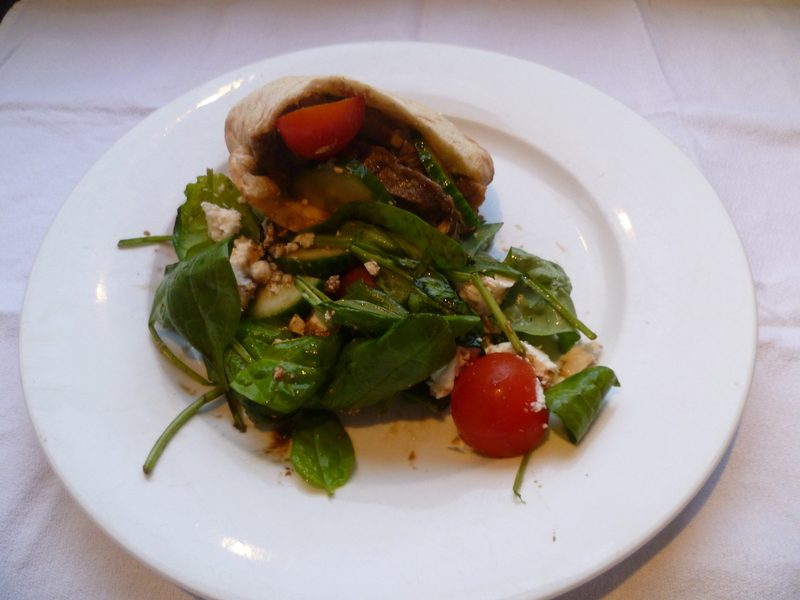 Fill the pitas with salad and lamb and top with a sauce made of the hummus and yoghurt mixed together. You can serve extra salad on the side. Kids: My kids would not eat this salad. My 6 year old will happily eat a pita pocket filled with salad and meat, while for my 4 year old I serve raw veges, brush half a toasted pita with garlic butter and serve the lamb separately.